According to many Americans, football and alcohol are virtually inseparable. The connection extends from the nation's deep tailgating traditions to the steady stream of beer commercials that viewers absorb during each televised game. Yet, as the NFL wrestles with difficult questions about its future from concerns about brain damage to a troubling pattern of domestic violence among its players, nothing seems immune to controversy. Will football's connection to booze also come under fire? Is gameday drinking a harmless way to blow off steam or a pattern of unsettling excess our culture must address? To analyze these questions in greater detail, we surveyed over 900 NFL fans about their alcohol consumption habits, both at home and at the stadium. Their confessions revealed just how rowdy tailgating can get and which fan bases indulged to a greater extent than others. We also explored whether fans drink more when their team is winning or losing and the consequences that sometimes ensue from intense intoxication on game day. Want to see how your own football-related drinking compares to the average fan's alcohol consumption? Keep reading. For many football fans, drinking gets going long before kickoff. In fact, nearly a third of respondents reported pregaming, beginning their alcohol consumption two hours before the game began on average. Pregamers didn't imbibe just a single beer over that period either: Typically, they had three or more. That rate of consumption exceeds what the average liver can process per hour, meaning those who pregame probably experience a "buzz" before the players even take the field. Perhaps it's no surprise that alcohol breeds altercations: A fifth of fans admitted they'd gotten into a verbal spat with someone before a game. On some unfortunate occasions, pregame parking lot arguments have escalated to physical violence as well. To add a dose of competition to their pregame alcohol consumption, tailgaters play a variety of drinking games. Among an array of options, beer pong proved most popular: Four in five respondents said they'd participated in this form of pregaming before. Flip cup ranked second overall, with 53 percent of pregamers having played this game. That both these games involve large tables indicates just how extensive fans' tailgate setups can be. Other common methods, such as shotgunning a beer, were also cited and typically require less preparation. Relatively few fans can regularly watch their teams in person: With NFL tickets typically costing hundreds of dollars, it's no surprise that merely 6.6 percent of respondents said they usually attend games live. While watching from home was the most popular option, other locations seemed to lend themselves to heavy drinking. People who watched at a viewing party or bar threw back over seven drinks on average, and those who camped out in the stadium parking lot had more than eight during the course of their game day drinking experience. Depending on location, the time frame in which those drinks are consumed can vary widely: Some stadiums open their parking lots to tailgaters up to five hours before game time, whereas others keep fans away until 90 minutes before kickoff. 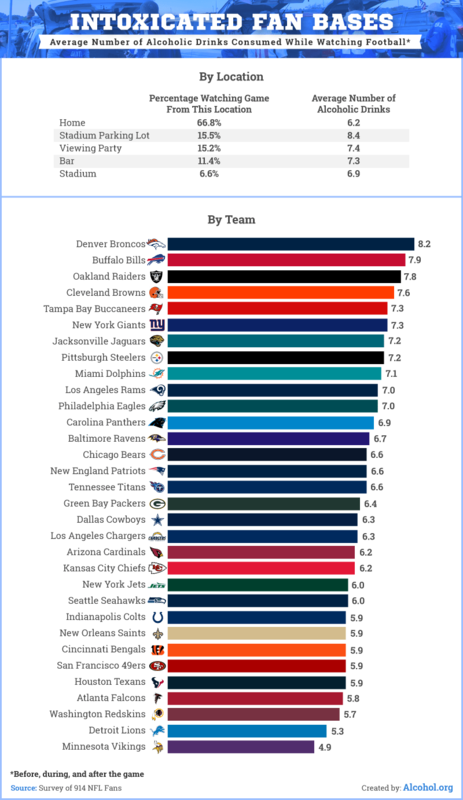 We also analyzed typical consumption levels for fans of each franchise, finding that Broncos fans had the greatest number of drinks on average. They were followed by Buffalo Bills fans, who have a long tradition of outrageously inebriated tailgating activities, such as "table slamming." Meanwhile, Vikings and Lions fans distinguished themselves as the soberest fan bases in the land on average. That may soon change in Detroit, where the team has reduced beer prices in an attempt to bring fans to the stands. You may have noticed that many of the heaviest-drinking franchises have seen their teams fall on hard times in recent years. Does a losing team cause fans to drown their sorrows? While technically a depressant, alcohol might appeal to long-suffering fans looking to lift their mood. Among respondents, just 22 percent said they tend to drink more when their teams performed poorly, and 15 percent said their alcohol consumption actually declined in these bad times. Yet our data suggest that some fanbases are more likely to turn to alcohol to numb the pain of a poor season than others. Four in 10 Saints fans, for example, admitted to drinking more heavily when their team was playing poorly: While New Orleans is known for its exuberant celebrations, it seems the city treats a loss with alcohol as well. Additionally, a third of Kansas City Chiefs fans reported drinking in tough times for the franchise, though success1 in recent seasons means they've had little reason to do so. 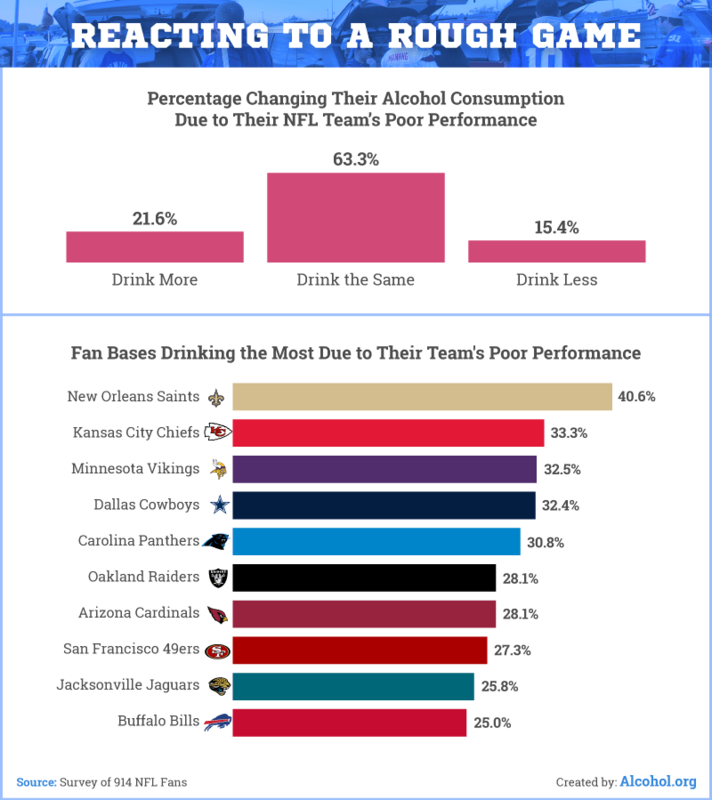 Even Minnesota Vikings fans, who drank least overall among NFL followers, ranked third for increased drinking when their team was down. Of course, fans also celebrate team success by partying, so a winning season might present as many opportunities to drink as a losing one. Indeed, 28 percent of fans said they drink more when their team is on a roll, and less than 8 percent cut back their drinking during triumphant times. No one can begrudge excited fans a chance to bask in their teams' glory, but post-win partying can get excessive quickly. In Philadelphia, for example, mobs of fans celebrating the Eagles' 2018 big win vandalized stores, climbed street poles, and even flipped a car. 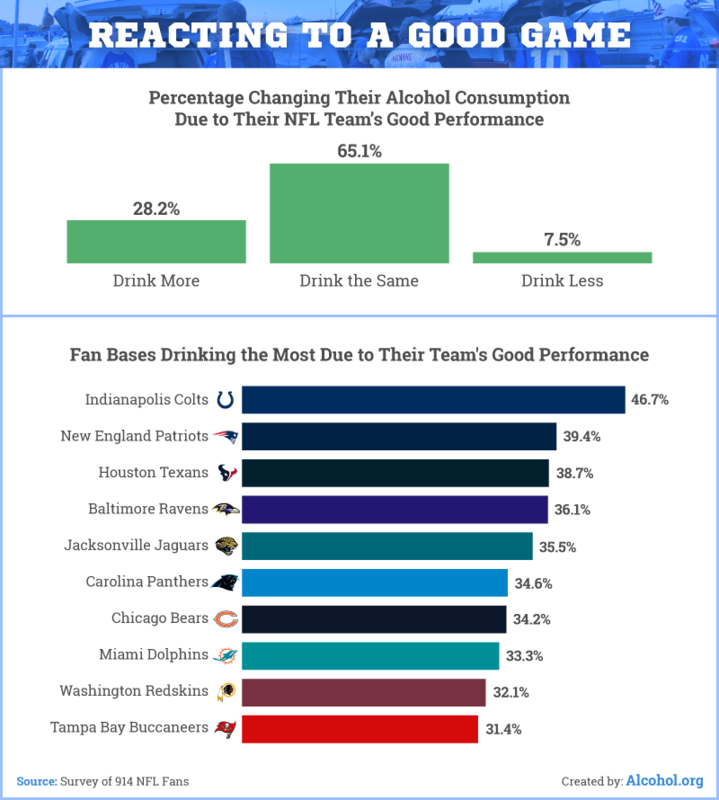 Indianapolis Colts fans were most likely to consume more alcohol when their team was playing well, with nearly 47 percent of fans reporting doing so (given a string of unremarkable seasons since 2015, they've probably been pretty sober of late). Conversely, fans of perennial contenders the Patriots have had plenty of reasons2 to celebrate in recent years, and 39 percent increased their drinking to accompany the team's success. In Houston, where a similar portion of fans drank more in good times, success is probably a relative term: Though they haven't surpassed 9-7 in any year since 2012, that mediocre mark was enough to win their division in 2015 and 2016. Regardless of setting, heavy drinking can result in ugly consequences. Football games seemed to entail particular perils, including arguments with other fans. Thirty-one percent of fans had engaged in verbal altercations while drinking during a game, and another 14 percent said they'd been in a physical fight. Other common outcomes included "blacking out" and vomiting. 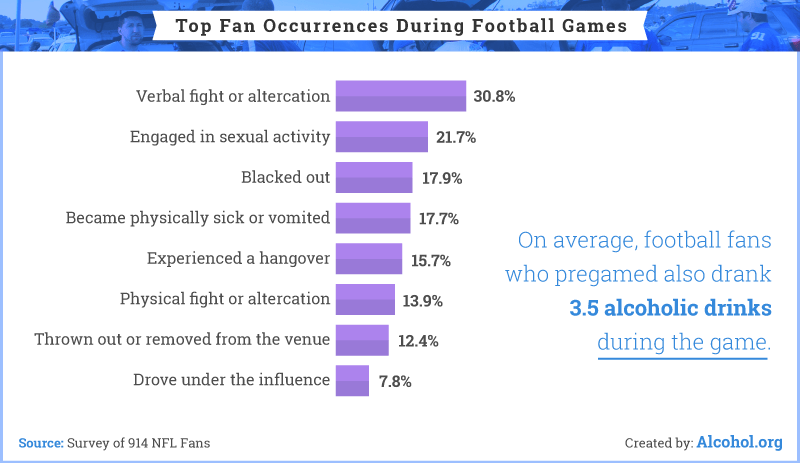 Nearly 16 percent of fans reported feeling hungover at the game itself, presumably because they had pregamed earlier. Most pregamers kept on drinking during the games, however: Those who had played drinking games beforehand consumed another 3.5 drinks on average over the course of the game. 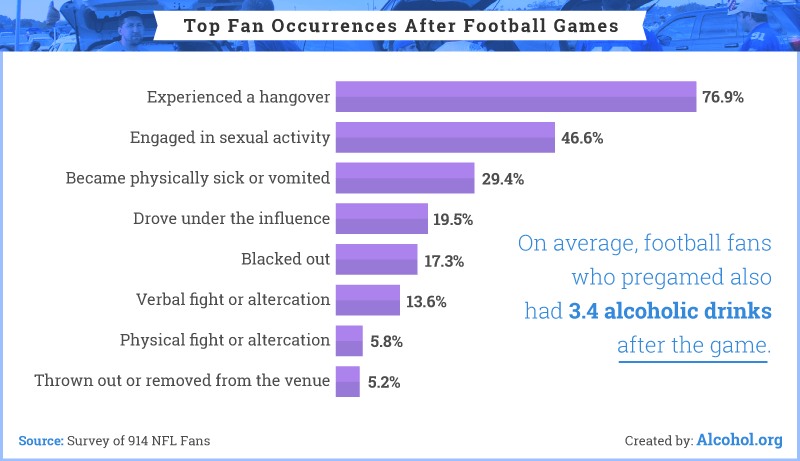 For many, the consequences of game-day drinking didn't kick in until after play had ended: More than three-quarters of fans reported experiencing a hangover following football-related festivities. 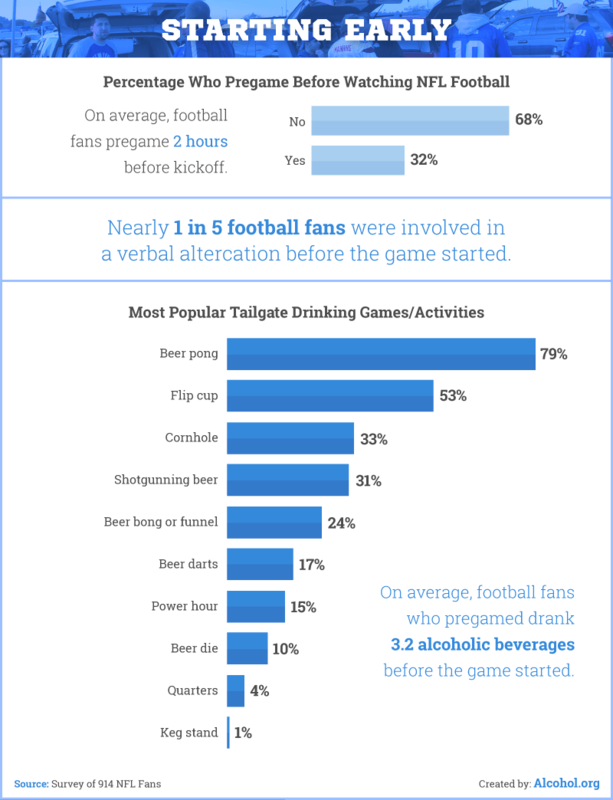 Physical and verbal altercations were somewhat less common after a game concluded, but another risk presented itself: Nearly 1 in 5 fans reported driving under the influence. Indeed, it seems fans who begin drinking early don't give themselves the chance to sober up: Those who pregamed reported drinking another 3.4 drinks after the game, on average. 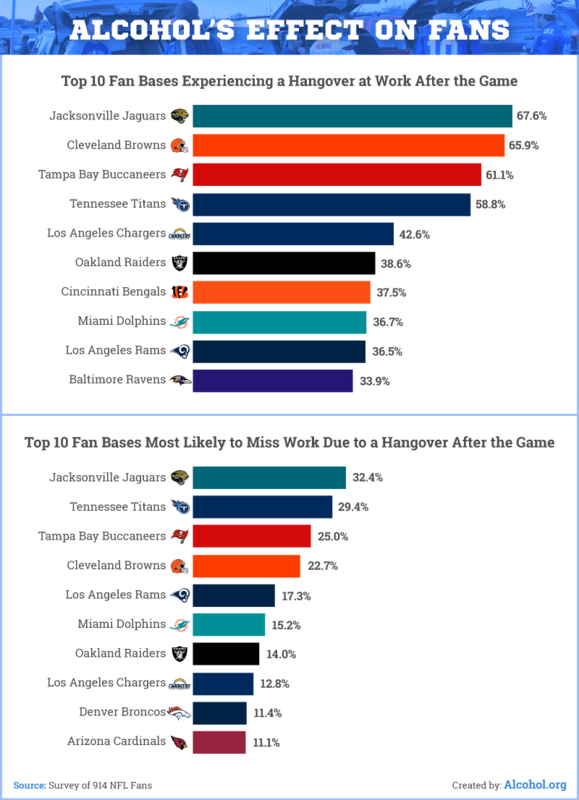 Sorry, Jacksonville-area employers: Jaguars fans were most likely to report being hungover at work following a game-day experience – and to miss work entirely on Monday. On the other side of the state, Tampa Bay fans hardly fared better, ranking third for hangovers and missed work following football-related drinking. Given a string of dismal seasons in recent years, it's unlikely Bucs3 and Jaguars4 fans were celebrating victories when they indulged a bit too freely. Cleveland Browns fans, of whom nearly two-thirds reported being hungover at work after drinking during a game, have had even less to celebrate, going winless5 in 2017. California teams were particularly well-represented in our hangover and missed work rankings: Who could blame Los Angeles residents for overdoing it following the arrival of two NFL franchises in their city? Tennessee Titans fans were also featured prominently on both lists – though that finding could stem as much from Nashville's intense drinking culture as anything related to the team. The same could be said for Dolphins fans: Though the team has had largely lackluster results6 for some time, Miami's party scene remains undefeated. Our findings suggest that football fans indulge frequently and heavily while cheering on their teams, and alcohol flows freely whether or not their squad succeeds. While many of the outcomes of this drinking tradition are troubling, including physical altercations and work absences, it seems likely that the association between football and alcohol will endure for the foreseeable future. Accordingly, we hope you'll think ahead if you plan to drink during a game, whether you're at the stadium or on your buddy's couch. That means never consuming so much that you endanger yourself or others, and always catching a ride home from someone sober. Of course, those struggling with alcohol use may find it difficult to place limits on their drinking despite mounting concerns and consequences. If you or someone you care about is suffering due to their alcohol consumption, you need to know that effective and ethical help is available. Let the team at Alcohol.org help you explore your treatment options. We've helped thousands of individuals and families find the support they need to embrace a new way of living. You deserve the same opportunity, so let us help you seize it. We collected responses from 2,739 participants from Amazon's Mechanical Turk, NFL Team Reddit pages, and NFL Team Facebook pages. Of the 2,739 respondents, only 914 qualified to complete this particular study. Of the respondents, 30 percent were women and 70 percent were men. Participants ranged in age from 18 to 76 years old with a mean of 31 and a standard deviation of 9.9.Participants were excluded if they were not a fan of the NFL, if they did not answer an attention-check question correctly, or if the quota for a particular team had already been met. The data that is presented in our study relies on self-report and could, therefore, have issues synonymous with all self-reported content such as selective memory, telescoping, attribution, and exaggeration of individual respondents.